Christmas of 1984 brings to mind a ridiculous amount of memories. There was the electronics set my brother got (which I happened to buy for myself at the flea market this morning for $3). There was the audio cassette tape that recorded about an hour of the Christmas morning festivities in our house (which, of course, is still around). There was the other cassette tape filled with songs my brother had gotten from our cousins -- the Footloose soundtrack, The Cars. But these are topics for another day. 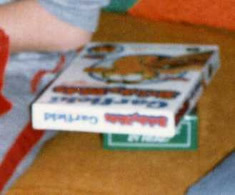 Looking back at pictures of Christmas from that year, I noticed a small detail I had missed up until now. 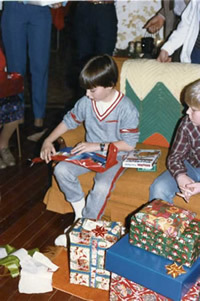 At my grandparents' house for Christmas, the picture to the left shows me opening a package of markers -- a gift I probably liked considering how much time my brother and I spent drawing masterpieces such as the General Lee jumping over a canyon. But what is that on the couch next to me? Looking past my cool track suit and Star Wars watch, there's no question that that's a brand new set of Garfield Shrinky Dinks! 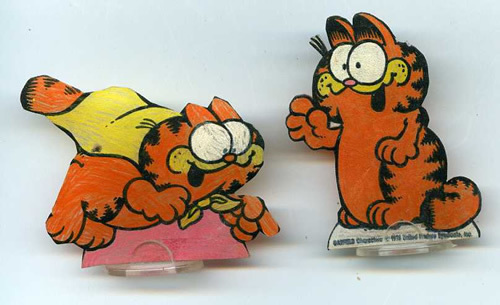 While the original box is long gone, two of the Shrinky Dinks still remain...complete with their plastic stands. While many people throw away the things of their youth as they grow older, I am proud that these two pieces of baked plastic colored with pencils are still around after almost thirty years! You would have to cut around your individual character and then stick it in the oven. What I always liked to do was take the leftover blank pieces and try and draw my own characters, then make custom Shrinky Dinks. I found a Monsters Inc set a few years back and showed my niece the joy of the heating plastic.